Automatic Laser Details - Quasius Equipment, Inc.
Our CST/Berger visible beam laser is perfect for either interior or exterior work. It features dual beams for leveling in horizontal or vertical plumb and is self-levling. For interior work, it's superior beam intensity will help cut through ambient light in rooms that have not been sufficiently darkened enough for the manual laser's use. It's self-leveling capability yields accuracy of within 1/16" at 100'. It features a variable speed rotation and has the ability to set grades up to 10%. 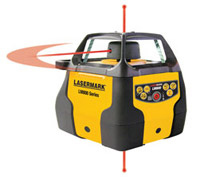 The maximum recommended range is a 200' diameter circle when used as a visible beam laser but for outside work or brightly lit interior conditions the included detector will increase the maximum range to a 2,800' diameter circle. The premium LD-400 laser detector features both front and rear LCD displays, three levels of beam resolution, automatic shutoff to conserve battery life, and audible indication of high-low-level conditions. The unit is available with a wall bracket for suspended ceiling work as well as a tripod and 16' grade stick for exterior applications.